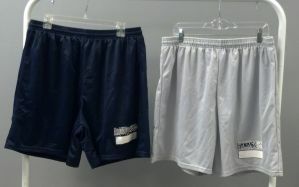 SILVERADO HIGH SCHOOL PE SHORTS AVAILABLE IN THE WEBSTORE. BLUE IS AVAILABLE IN ALL SIZES. GRAY ONLY AVAILABLE IN 2X & 3X. BRING EMAIL RECEIPT TO STUDENT STORE FOR PICK UP.